Whilst the giants of venture capital and major investors in the technology sector have long since embraced Twitter as a vital communication tool, the wider private equity industry has been slow to follow. Signs are now emerging however of greater engagement with Twitter by private equity bosses, lawyers, capital investors and consultants as a way of demonstrating thought leadership and industry presence. Whilst it would be jumping the gun to suggest that the social media platform is being widely used as a tool to generate deal opportunities, it is clear that the private equity industry is catching up with other financial sectors in its embrace of Twitter. We list below some of the best operators in the industry – both individuals and firms – based not just on number of followers, but levels of engaging content. We recommend following them. A partner at law firm Squire Patton Boggs, Tim Hewens heads the UK Private Equity team, with particular expertise in Mergers & Acquisitions. He was recommended in The Legal 500 in 2014 for his ‘market leading breadth of knowledge in the transactional Private Equity arena’. His regular posts on PE industry news and deals in the media makes his Twitter feed an excellent source of information, and demonstrates his firm’s leadership in the PE arena. 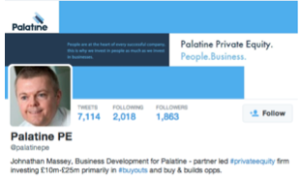 Johnathan Massey is Head of Business Development at Palatine, with more than 10 years experience in private equity. He has built up a firm following in the sector through his highly engaging posts, which include a mix of thought leadership content from Palatine and snippets of life in Manchester. 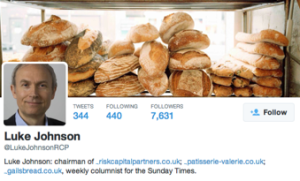 A highly effective Twitter profile that brings personality to the firm. Craig Peterson is COO of Growth Capital Ventures, with a wealth of experience developing and growing businesses. His passion for entrepreneurship and innovation shine through his Twitter feed, which is regularly updated with content and tips for start-ups looking to raise capital, with re-tweeted links to thought leadership material in the media. 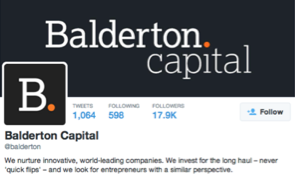 Balderton is one of the largest venture capital funds in Europe, with an aim to build long-lasting, game changing companies. 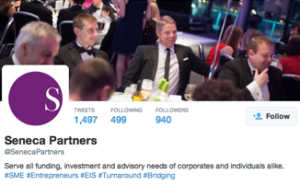 The company’s entrepreneurial ethos is reflected in its highly effective Twitter feed, which gives an insight into the firm through news updates, blogs, photos from its events and recently, an online office tour. This feed is an excellent example of how to use Twitter to bring personality to your corporate branding and demonstrate industry knowledge and leadership. Kelvin Capital was founded in 2009 and has grown year on year to become one of the leading investment businesses in Scotland. The company’s Twitter feed is a great source of investment thought leadership and trends, together with links to interviews with some of the world’s leading investors. An example of how to engage your target audience by developing a strong industry news feed. 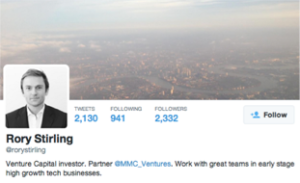 Partner at MMC Ventures, an award-winning investor that has been backing fast-growing early stage companies since 2000, Rory Stirling has attracted a strong Twitter following thanks to his engaging posts. His passion for technology is clear from his regular posts on leading-edge developments in FinTech, including regular links to video content such as TEDx talks and industry panels. A strong news source of industry developments. Nicholas Assef is an investment banker, with a highly active and engaging feed on business trends and investment news. A super sharp source of leading edge industry developments from a range of global media outlets, this feed successfully presents Assef as a leading voice in M&A. Robert Gardner is the CEO of Redington, an award winning investment consultancy with 48 clients and over £270 billion assets under consulting. His Twitter is packed with great industry thought leadership content, particularly around the issue of engaging young people to take control of their finances. 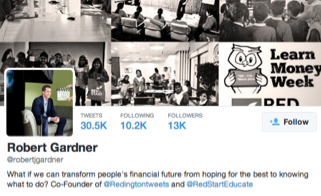 Gardner demonstrates how CEO’s in the financial industry can use Twitter to demonstrate good corporate citizenship. Luke Johnson is Chairman of Risk Capital Partners and a well-known entrepreneur with a high profile through columns in the Sunday Times and the FT.
Luke’s posts are used to great effect in amplifying his regular print contributions and public and broadcast appearances, ultimately serving to underline his reputation as one of the UK’s leading investment experts. Lastly but by no means least, the last entry on our Twitter ‘best-practice’ list is Seneca Partners, a leading investment advisory firm for corporations and individuals. Seneca’s regular posts are particularly effective in driving awareness of the firm’s thought leadership programme in the media (with links to interviews and expert commentary) – amplifying content to a digital audience.